Peter D. Warwick is the project chief of the Utilization of Carbon and other Energy Gases–Geologic Research and Assessments Project. His scientific and technical specialties include sedimentology, stratigraphy, the geology of fossil fuels, and geologic carbon sequestration. His career with the USGS has focused on energy-related research, exploration, and resource assessments in various sedimentary basins in North and South America, Europe, and Asia. He has authored or co-authored more than 200 scientific research publications. In addition, Dr. Warwick has served as the President of the Energy Minerals Division of the American Association of Petroleum Geologists (AAPG) and is an AAPG Charles Taylor Fellow. He has been President of The Society for Organic Petrology, and Chair of the Coal Geology Division of the Geological Society of America (GSA). He is a GSA Fellow and an active member of several scientific journal review boards. Dr. Warwick received a B.S. in Political Science and Geology and a M.S. in Geology from North Carolina State University. He received a Ph.D. in Geology from the University of Kentucky. Jahediesfanjani, Hossein; Warwick, Peter D.; Anderson, Steven T.
Warwick, Peter D.; Corum, Margo D.; Craddock, William H.; Merrill, Matthew D.; Roberts-Ashby, Tina L.; Brennan, Sean T.; Buursink, Marc L.; Drake, Ronald M.; Warwick, Peter D.; Cahan, Steven M.; DeVera, Christina A.; Freeman, Philip A.; Gosai, Mayur A.; Lohr, Celeste D.
Craddock, W.H., Merrill, M.D., Roberts-Ashby, T.L., Brennan, S.T., Buursink, M.L., Drake, R.M., II, Warwick, P.D., Cahan, S.M., DeVera, C.A., Freeman, P.A., Gosai, M.A., and Lohr, C.D., 2018, Geologic framework for the national assessment of carbon dioxide storage resources—Atlantic Coastal Plain and Eastern Mesozoic Rift Basins, chap. 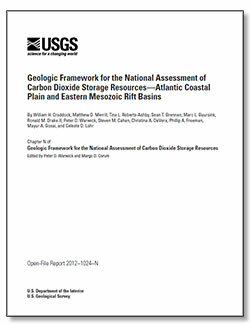 N of Warwick, P.D., and Corum, M.D., eds., Geologic framework for the national assessment of carbon dioxide storage resources: U.S. Geological Survey Open-File Report 2012–1024, 32 p., https://doi.org/10.3133/ofr20121024N. Carolus, Marshall; Biglarbigi, Khosrow; Warwick, Peter D.; Attanasi, Emil D.; Freeman, Philip A.; Lohr, Celeste D.
Carolus, Marshall, Biglarbigi, Khosrow, Warwick, P.D., Attanasi, E.D., Freeman, P.A., and Lohr, C.D., 2018, Overview of a compre­hensive resource database for the assessment of recoverable hydrocarbons produced by carbon dioxide enhanced oil recovery (ver. 1.1 June 2018): U.S. Geological Survey Techniques and Methods, book 7, chap. C16, 31 p., https://doi.org/10.3133/tm7C16. 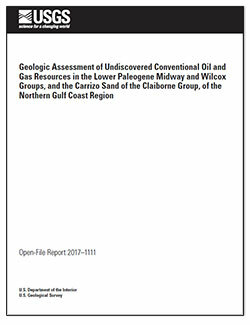 Warwick, P.D., 2017, Geologic assessment of undiscovered conventional oil and gas resources in the lower Paleogene Midway and Wilcox Groups, and the Carrizo Sand of the Claiborne Group, of the northern Gulf Coast region: U.S. Geological Survey Open-File Report 2017–1111, 67 p., https://doi.org/10.3133/ofr20171111. Shelton, Jenna L.; Akob, Denise M.; McIntosh, Jennifer C.; Fierer, Noah; Spear, John R.; Warwick, Peter D.; McCray, John E.
Shelton, J. L., Akob, D. M., McIntosh, J. C., Fierer, N., Spear, J. R., Warwick, P. D., & McCray, J. E. (2016). Environmental Drivers of Differences in Microbial Community Structure in Crude Oil Reservoirs across a Methanogenic Gradient. Frontiers in Microbiology, 7. Warwick, Peter D.; Ruppert, Leslie F.
Warwick. P.D., and Ruppert, L.F., 2016, Carbon and oxygen isotopic composition of coal and carbon dioxide derived from laboratory coal combustion─A preliminary study: International Journal of Coal Geology, v. 166, p. 128-135, available at http://dx.doi.org/10.1016/j.coal.2016.06.009. Shelton, Jenna L.; McIntosh, Jennifer C.; Hunt, Andrew; Beebe, Thomas L; Parker, Andrew D; Warwick, Peter D.; Drake, Ronald; McCray, John E.
Shelton, Jenna L.; McIntosh, Jennifer C.; Warwick, Peter D.; McCray, John E.
Warwick, P.D., 1985, Depositional environments and petrology of the Felix coal interval (Eocene), Powder River Basin, Wyoming: Lexington, University of Kentucky, Ph.D. dissertation, 333 p. 27 figs. Flores, R.M., and Warwick, P.D., 1984, Dynamics of coal deposition in intermontane alluvial paleoenvironments, Eocene Wasatch Formation, Powder River Basin, Wyoming, in 1984 Proceedings of the Symposium on the Geology of Rocky Mountain Coal, Houghton, R.L., and Clausen, E.N., eds. : North Dakota Geological Society Special Publication 84-1, p. 184-199, 11 figs. Belt, E.S., Flores, R.M., Warwick, P.D., Conway, K.M., Johnson, K.R., and Waskowitz, R.S., 1984, Relationship of fluvio-deltaic facies to coal deposition in the Lower Fort Union Formation (Paleocene), south-western North Dakota, in Sedimentology of coal and coal-bearing sequences, Rahmani, R.A., and Flores, R.M., eds. : International Association of Sedimentologists Special Publication no. 7, p. 177-198, 19 figs. Warwick, P.D., 1982, The geology of some lignite-bearing fluvial deposits (Paleocene), southwestern North Dakota: Raleigh, North Carolina State University, M.S. thesis, 116 p., 20 figs. 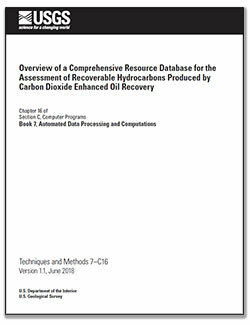 Select the thumbnail image above to open a downloadable and printable slideshow presentation in .pdf format [1.4 MB] titled, 'A Probabilistic Assessment Methodology for the Evaluation of Geologic Carbon Dioxide Storage'. This presentation is material from a U.S. Dept. of the Interior talk. Select the thumbnail image above to open a downloadable and printable slideshow presentation in .pdf format [1.9 MB] titled, 'Examining Salinity Restrictions for CO2 Storage: Suggestions from basin to reservoir scales'. This presentation is material from the GWPC 2011: Carbon Capture & Storage & Groundwater meeting September 26, 2011. Select the thumbnail image above to open a downloadable and printable slideshow presentation in .pdf format [2.2 MB] titled, 'National Assessment of Geologic Carbon Dioxide Storage Resources—Results'. This presentation is material from a USGS talk. Select the thumbnail image above to open a downloadable and printable slideshow presentation in .pdf format [2.3 MB] titled, 'U.S. Geological Survey National Assessment of Geologic Carbon Dioxide Storage Resources and Associated Research'. This presentation is material from a June 5, 2014 U.S. Energy Association talk. The U.S. Geological Survey has evaluated three methods for estimating how much oil and gas could be produced by injecting carbon dioxide (CO2) into petroleum reservoirs. The USGS methodology for assessing carbon dioxide (CO2) storage potential for geologic carbon sequestration was endorsed as a best practice for a country-wide storage potential assessment by the International Energy Agency (IEA). 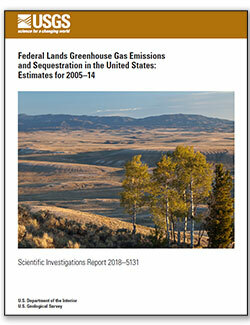 A new methodology to assess the nation's potential to store carbon dioxide (CO2) is available.